Most of you know we just put our home on the market to sell. I decided to de personalize the house a little bit of my decor. We are getting a lot of young first time home buyers looking at this house and they seem to like stream line and sleek looking homes. Well my chippy shabby home is certainly not modern or sleek lines. Younger buyers seem to have a hard time seeing past decor and looking at all the up grades the house has to offer. One realtor as hard as she tried to get her young buyers to see the hard wood floors throughout and top of the line stainless steel appliances, newer furnace, air conditioner and windows and roof etc. etc. they just could not see past my decor. Some buyers are hung up on decor and wanting move in ready homes that fit their taste. While that is great they still have to be educated on how costly upgrading things in a home can be. Most of that has been done in this home. Most of the feed back has been very positive and we have had a few couples come back for a second look already. So for one week on the market I think that is great. With all of this said Terry and I decided on Saturday to take down the vintage door divider wall between my office and the dining room. So the divider wall before. Loved that this divided my office area from the dining room. The divider wall came down to open up the space. Hoping buyers will see this space back where my office is currently could be a perfect place for a dining table leaving the rest of the room open for other possibilities such as a family room. Most of my personal stuff has been removed and packed up to be moved. I wanted to keep the wall free of too much decor. This way the buyer can see how neutral the walls are for their decor choice. The before. I took a lot of my personal style down and packed it away. I added a few things back on the wall but not much. I wanted to not have it be to stark but I wanted the buyers to be able to envision their style in this room. Now what I have as my dining room could remain like that for the new buyers or it could be used as a family room with french doors out to the back yard deck. You can see my photo bomber is not impressed with the changes lol! By taking some of my signature decor down helps me to start to detach from this home. I have loved this home and have loved it being my style. Now it is time for new buyers to come and make this home truly their own style. With all the frustration of Terry trying to find a new job and us having no control over a lot of things going on in our lives it felt good to have control over making some changes to this house to help new buyers see the potential. Have a great rest of the week. We are in the mid 70's all week and sunshine no rain expected. Just a gorgeous week. Be sure to come back on Saturday to meet another blogger in the Spotlight. I did not know. Where are yo moving? Why? I know when we sold our house in ATL the realtor instructed us to depersonalize. I did not listen. It sold in less than a month. It just take ONE to fall in love and see the potential. Our purchaser bought for the large yard.....so she did not even care much above inside. xo GOOD LUCK! Good luck, I know you have loved this house, but the Lord has the perfect buyer and the perfect house for you. Hopefully it will sell soon. Hi Kris, Whenever we have sold homes, I have found it hard to have them critiqued by realtors and would be home buyers. When I look at a house, I have no problem seeing past the current owner's stuff so I don't get why others have such trouble with that. I think your attitude is great in that de-personalizing your home is helping you detach. You really have some good sized space there and with all the upgrades you have done, I can't imagine that your house won't sell soon. Sending you hugs this week. Enjoy the beautiful weather! Selling a home is so difficult sometimes, and yes, it is amazing how few people can see possibilities. Good luck sweetie! I like watching alot of home improvement shows and ones that sell the homes too. One thing I have learn is that most buyers are too busy looking at your decor and not the home. I cannot imagine anyone not seeing those beautiful wood floors. I think you are doing the right thing by opening up the space and depersonalizing it. So many potential buyers just don't have any imagination. Sending selling vibes your way! I think it was wise to remove the divider wall. It really opens your home up. I never knew that room was so large. I actually like it better. But I like wide open bare space. My home probably looks and feels too emplty for you. Best wishes. I believe it will sell fast because potential buyers will be able to see that you have taken good care of the home. When we first started looking at potential homes many years ago, we had no problem looking past the current decor, etc. but I know that's hard for some people. You have a beautiful home and it's very promising that you've already had so many showings! I am sad to see your amazing wall go but I know your house is going to sell soon and that will be one less thing you have to worry about packing!!!!! Young buyers today are very different......I'll just leave it at that! Your home is/was lovely and perfect for YOU and YOUR family. However, with that being said, "You are selling a house and not a home". To help your targeted market (young buyers who like streamline) you really need to depersonalize you home all-the-way. Remove all things that made your house cottage and bring your house back to the basics. No frills on the walls, furniture or windows. I would suggest Googling "Home Staging" and take it to heart. More Pottery Barn and Create and Barrel and less shabby chic. The quicker you sell the quicker you can make your new house a home that is perfect for you and your family. Good luck with your sell and I hope that you find a place to call home real soon. It is hard to understand that some people have very little imagination when it comes to seeing past the décor, but I know it's true. Your home is lovely and will sell, Kris, I know it! Yes, I had to take down my decor and paint walls as suggested by our realtor and believe it or not, it sold after the 2nd showing when we had tried 3 other times to no avail. Bless you. This is so hard. Made me feel so empty. Just look at it as a new beginning and a clean slate. Moving can be such an ordeal! I like your attitude about it. That last shot of your room is just gorgeous still. To me it always feels good to be doing something to move things along. But then I'm not very patient! Hahah! Best of luck with the sale! It's just a matter of time. Gosh, I bet that's all hard to do because you don't want to move anyway. I wondered about the shabby chic look when trying to sell a house. You are right - not everyone will see past it. The good news is that now somebody might pop in there and see all the wonderfulness. The bittersweet news might be a quick sell. It's hard to depersonalize a home but I do think people can see the structure of the home instead of your stuff. People can't see past that. You are so right to declutter and depersonalize.....I know its hard, but people have no imagination and can't see past that!! My sister recently sold her home.......in 3 weeks and for the asking price!!! She took everything off the walls, removed most of the decor, cleaned off the kitchen counters, removed all the rugs to expose the wood floors, packed up stuff and moved the boxes to the garage. The realtor wanted her to remove the wallpaper and she stopped at that, no way could she do that kind of work!! But she did take down all the frilly curtains too. I heard that less personal stuff on the walls and around the house the better, but I know that has to be hard. Your weather sounds lovely! My kind of temperature and SUN!! Awww, Kris, I know this is difficult for you, but you are right to make the changes. Buyers want minimal, clean lines, and everything put in place for them. It is difficult for them to imagine themselves in the home if you don't do it for them. That's the downside of selling. And realtors want you to have as few personal items as possible to achieve this for the buyer. Hugs to you!!! I know it's difficult!! Well it took a lot of strength and fortitude to start simplifying your home. I had to go through the same thing when we sold ours, but as you said it is a good way to start letting go and moving on. I hope that you have some good offers coming in soon. It must be very difficoult to remove all the wonderful things and decors you have...Good luck for everything. Such a nice big room, Kris. I'm sure someone is going to see your house and fall in love. I remember how difficult it was to take down all our stuff when we put our house on Long Island on the market ~ especially after 21 years of living there! It looks huge! I hope it sells soon and you can begin a new chapter. I know how hard this was for you, but also if by the stroke of what ever happens and you end up staying with Terry having the perfect job offer, it will be like you moving in all over again and that can be fun to arrange things in ways you though not possible. I know I mentioned this in my last comment to you on delclutter, as a designer and working on Staging Model homes it's a given as to what ones will be turned off at with designs, and not see the home for what it has to offer. It's a good thing you are doing this, and when it does sale it won't feel so much like you are giving up on your life, but creating a new and beautiful one in a new home. And I bet you too will be looking at the home as to how it will accomadate your style as we all do. 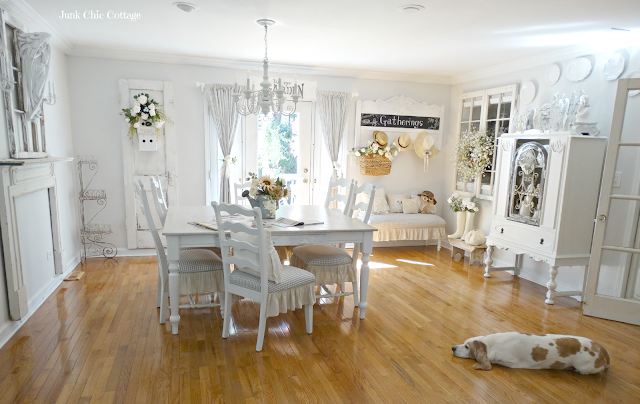 Basic things in a house, and white is perfectly fine, but all the garlands over windows, and old headers, and murals of sweet signs, and collected cottage will contemporize your home with equal beauty, yet show off all that the attention should be on. I helped a friend do just that, her home sat on the market 9 months they were dying on the vine financially and I volunteered my time, spent 3 long days packing up everything leaving the big focal pieces, accenting with more contemporary throw pillows to her white furniture and took everything off the walls but one great salvaged piece, or canvas painting. Opened up the drapes with tie backs, and let the home sing. Playing soft contemporary music in the back ground with a covered cake stand full of goodies with a note help yourself. Potential buyers took a second look and it was at that time it then had 4 offers on the table and a bidding war started with the original client to the agent who said the home was all wrong for them. How did it go from wrong to all being right! 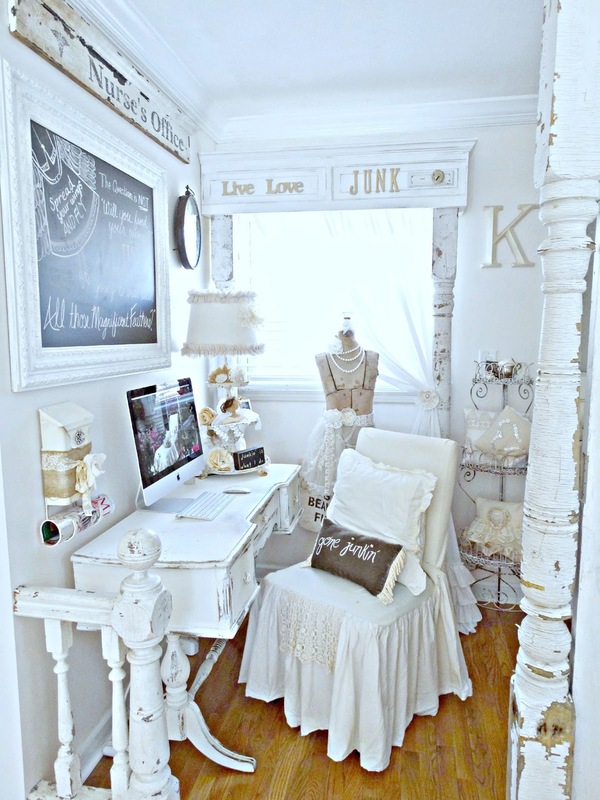 De personalizing it is the key, delclutter, and make it less homey. It has to feel like their home not yours. I mentioned take the bank of doors down open it up, the young want that open concept feeling, and the older want to know there lazy boy will fit right in Lol! Your doing good girl, hang in there, it will sale! And I bet you won't be crying with the offers, plus how about that adventure, a new home to personalize, more magazine features because of all the new charm. 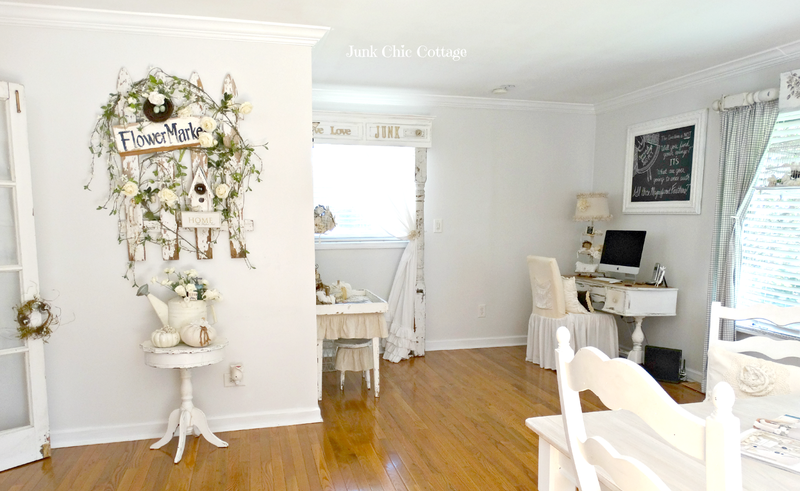 I truly am excited for you, even if you scale up, or scale down, it's all in how you personalize your home that it truly feels like home sweet cottage home. I can't wait to hear how your next open house goes, when everything you touch and pack away turns to sold. You can do the same to the front yard, neighbors will hate not seeing all your charm, but a clean well groomed manicured yard will allow that new home owner feel like he is mowing his lawn not yours, and having to move a birdhouse out of the way. A good agent will guide you, and you will see that in many cases homes have lager asking prices for less square footage when they can see what they are buying.....stick to your asking price don't budge. You will get it when they see the home as theirs. Love you girl, wish I lived up your street, I would jump right in to stage and help you! Kris, I know that it is so hard to see all your beautiful work being packaged away. But, the younger people want stress free living. Pottery Barn and furnishing like that. When my son sold both of their homes they had a stagger come in and do their thing. The first house sold in 5 days above the asking price and their last beautiful home sold in 2 days in bidding war and they got cash and more than they were asking. Everything went into a Pod. The younger generation likes more sleek, modern furnishings. They both probably work and don't have time to clean and do chores, so it's empty. Good luck, the right person will come along. Are you moving into an apartment until you know where Terry is going to work? I've given my self another year and then I will be making a move -so I will be getting rid of almost everything that I love and keeping only the bare minimum. I will give a lot to friends and family. I know it's hard to pack up some of your favorite things while your house is on the market but hopefully it will help it sell faster. I've heard that you should remove not just personal photos etc but excess furniture that might be hiding some of the homes best assets. We have to rethink our house when it's on the market and dress it for sale rather than for ourselves. I hope your changes will do the trick! You have beautiful hardwood floors. Buyers will like that. 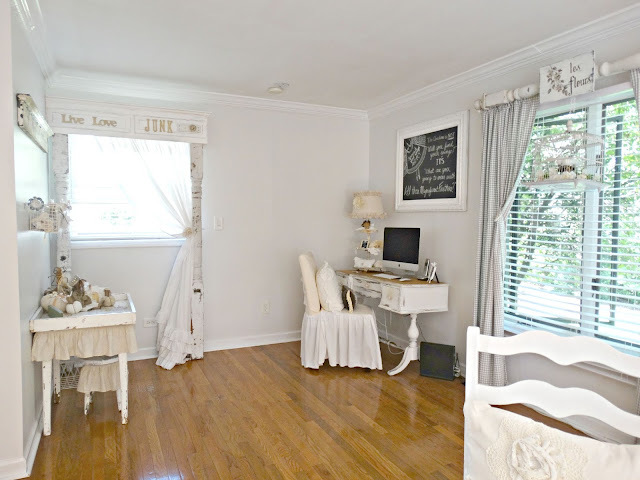 Yes, we decluttered our house before putting it on the market...we left only a very few pieces of furniture, nothing on the walls or windows, giving lookers a chance to envision THEIR tastes. We packed everything but just what we needed and, like you, taking out my personality helped me to move out of our home of 40 yrs a lot easier....we also had a place to move, so we were able to be moved (our son owns moving companies) and unpack as we went ....I wish you and Terry lots of luck on selling your house. Kris, I know it must have been so hard to undo all of the creative things you've done to make your home your sanctuary, but I think you're wise to make the changes you've made to make it easier to let go of your home. I'm so glad you've got your blog and all the magazine features to document this important part of your lives. I was heartbroken 11 years ago when we had to sell our home that we had put so much time and effort into, but as they say, when one door closes another door opens and I know it's going to happen soon for you and Terry. Your home is beautiful and it won't be long before the right buyer comes along. I know if can be difficult to sell a home that you've put so much of yourself into Kris, but you're doing the right thing by depersonalizing it. I'm an administrator in a real estate office and it's amazing to me how many people can't see beyond decor, and not only that... they tend to want everything just the way they like it, and usually that house doesn't even exist. Agents try to tell them to look at the really important things... like the bones and structure of a house... and the condition of the mechanicals etc, but so many don't listen or just can't see. I hope you sell your house soon, so your next chapter can begin. Everything looks great! I know it's hard but I think you did the right thing to make your sale quicker. It's so frustrating when people can't see past the decor. I think either you have vision or you don't and you're right, the structural stuff is big bucks. We have always looked for houses with good bones. Furniture and accessories don't come with the house and are cheaper than a roof replacement for sure! Sending lucky thoughts! Your home is so pretty, Kris, and I know it must be so hard having to dismantle and put away your lovely decor items, but that is what they say to do. As others have said, the buyers want to envision what the house will look like with their things in it and not be distracted with the homeowner's personal items. Best wishes as you await that lucky buyer who will undoubtedly come along soon! So sad to take your décor down but it is necessary for new buyers. My neighbor had the hardest time selling her house because it was full of color in every room! Finally a color loving buyer came along! I think the right person will fall in love with your home soon. It really is neutral with tons of potential for personalizing. I just don't understand why people can't see past the color of walls and what's on a wall to buy a home. Anyway.... I know what you are going thru is hard but the best is coming your way. xo where are you moving too? I hope the best for you in this transition and so sad but necessary to clear things out and up. Awe, I bet that was hard packing up all your treasures. Hugs sent your way Kris ♥ As a certified home stager,I get the need to depersonalize a home in order for it to sell, especially to a young buyer who wants move in ready according to their tastes. You did the right thing girl and hopefully an offer will soon arrive on your doorstep! When we sold our last home, I removed so much to let the rooms shine rather than my decor. I didn't need to in the end because the person who bought it was the realtor who sold it to us, but it did help me get packing. I am sad to see that beautiful space gone. Your office was just so cute! Selling a home can be such a difficult process, especially when you have to pack away all of your treasures and memories - it is like packing away a small piece of yourself. Young buyers today want that Pottery Barn or RH look - so frustrating for those of us who love shabby, cottage, farmhouse or coastal decor and are also collectors of pretty treasures. Hang in there - the right couple will fall in love with your home. It must have been difficult but I'm sure it was the right decision, Kris. Some people just can't look behind the furnishings and decorations when they prefer a different style. It's good when the process of packing up a lot of your favorite things helps you detaching from your home. I hope you'll get multiple offers for your home. I've sold 7 homes in my life, and the difference from the selling the first house in 1989 to selling one in this day and age is just incredible to me. I blame HGTV for that. As long as your home was clean and well taken care of, no one said a thing. People amazingly were able to look past the decor and no one had to "declutter" or "depersonalize". But sadly, that's the buyer of today. Try not to let the any of the negative "feedback" get you down, if you get it. I wish you all the luck in the world with the sale. Thank you Sharon. I love this house too. I know it will find a new buyer to love it. Kris, I hope you have a quick sale! I always laugh at these HGTV shows where people are house hunting. Sometimes they don't buy a home just because of a light fixture or the color of paint. I had to do the same thing when I was selling my home after hubby died. I had to take almost everything off the walls, repaint walls, remove any personal items and replace carpet upstairs. I packed and all went into the garage, even a few pieces of furniture. My house sold fast for a little over asking. Ya gotta do what ya gotta do to sell. Now almost a year later the value of the home has gone up $80,000!!!! I learned many years ago that most people can't visualize what a home can become for them. We who love decorating can immediately see potential, but so many can't. So it's probably a good thing that you took the wall down. I know moving is hard, we've had to do it enough with my husbands work...and I know I got attached to our homes, and how I decorated them. But every time we put our home up for sale I did the exact same thing, took my personality out of it. People buy a house so many times for the décor, it could be a house with no updates (furnace, a/c, roof, you know all the important stuff) and because the home is staged with expensive furniture people are overbidding for it - even though they are not buying the furniture! As someone who loves and appreciates how you decorate I could walk into your home and envision myself there! Good luck with your sale Kris, I am sure it will sell! It's a beautiful home! wise choice...however, I truly would have been the buying that bought your home solely (soulfully) based on your décor. It really is best to accommodate those who do not have the vision to look past décor and envision their own style within the floor plan. My mother and her sister both refused to do such depersonalizing staging when attempting to sell homes...and actually went as far as to lay out decorator mags and books opened to pages with similar styling. My opinion was they were attempting to sway others that they had made good choices (not my likely choices) in their styling....but it was more likely offensive it is application. The spoke to me and my sister on numerous occasions about neutralizing the colors...finally we just bought paint and repainted (against my mother's approval) and the home sold. Too funny that she believes it was market vs the painting, but ultimately we got them moved back to cali on our schedule and we only still have to occasionally here her share with her friends how "rude" her children were in painting the kitchen a warm white vs the lavender and the master bedroom a calming shade of grey vs in your face purple. Your wall color, upgraded appliances, floor plan, lovely floors and amazing (not to obnoxiously) big master bath will sell the home. It is great that buyers have come back for a second look...they are serious buyers and not looky loos...I see a contract in your future soon. Keep you chins up...remember a house is not your home. Home is where those you love live. Kris you home has great bones and is gorgeous! You will have no problem selling it. 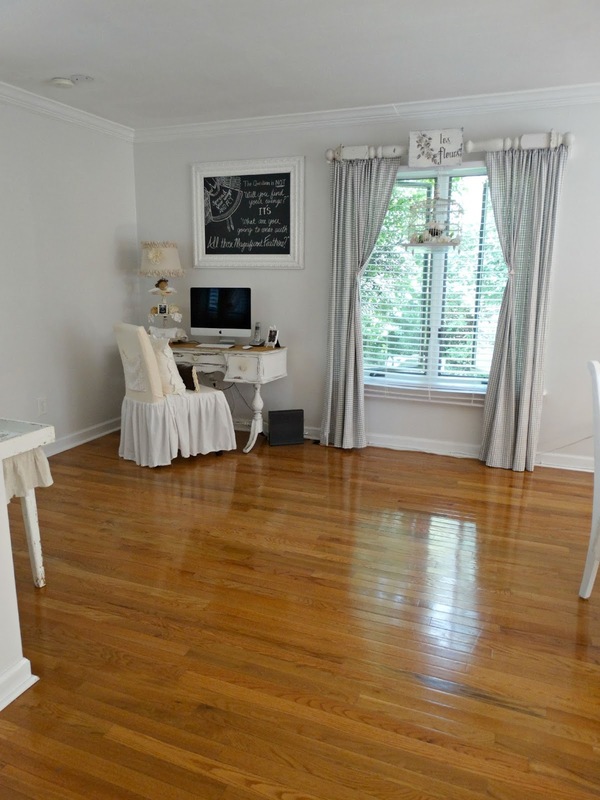 I am amazed that buyers look at decor, they are not buying that only the home. Oh Kris, this must be a stressful time for you and your husband. I do hope it all works out and the perfect buyer buys your house. Have a nice Thursday and end of the week. Hi Kris, I know too well the challenge of staging a house for selling and to motivate the interest of possible buyers by taking away our personal items. We had to do the same thing every time we moved. Packed my treasures away for a clean slat. Your home is gorgeous and maybe this is God's way of preparing you for the move. I know it will sell fast and whoever is the new home owner will be getting a gem!! Everything is new and updated. Move in ready. Saying a prayer for you and Terry. Have a great weekend with the nice weather and I hope you have lots of showings!! Oh Kris, taking down your style must be so hard, my heart goes out to you. Your new style will again come alive wherever your heart goes and I know it'll be just as beautiful. You'll have that new buyer in no time at all, just know it! You are so smart, Kris. It;s hard to take your stuff down, but most people have no imagination when they look at a space and have a hard time seeing it as their own. I know if we put this place up for sale, I will have to re-stage rooms to their original purpose and empty it out. Probably why we haven't put it up for sale yet lol. And you're getting some of your packing done this way, too! Hope that buyer comes along quickly! Kris, I was so sad to read about you putting your home on the market. It is so clear how much you & your husband love and enjoy it so. I know the frustration of dealing with buyers who are consumed with appearances over quality and value. I went through the same thing when I sold my home two years ago, and mine did not have half of the upgrades yours does. But the right buyers are out there as evidenced by some of the second lookers you have had. I am sure you and Terry will make a cozy loving home wherever you move to. I will keep you both in my thoughts and prayers. Best of luck and happy fall!!! What we see as style, others see as clutter.....imagine that!!! We had our house on the market a couple of years ago, and that was the feedback we got. 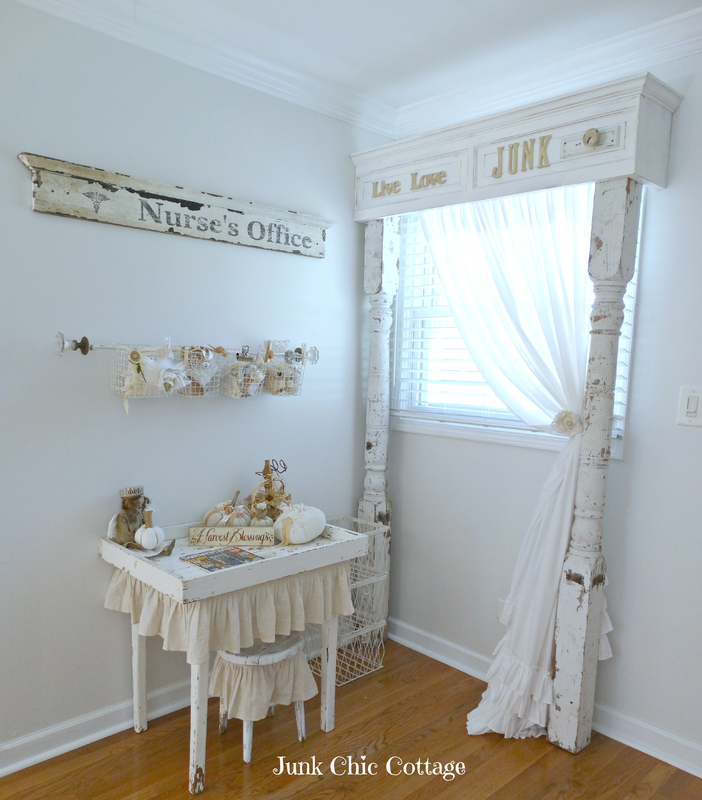 I am happy that we ended up taking ours off the market, for lots of reasons.....cause this old gal loves her "clutter"!!! You are doing the right thing, Kris. Letting the new buyers envision what they would do with the house is a good move on your part. Have a wonderful weekend, sweet friend. Your style is lovely. My daughter is in her early 20's and whenever I want to add some touches here and there she stops me. The younger kids like sleek lines and simple style, no ruffles and frills. We are planning on listing our house soon to move up to the fox lake/Antioch area, near where you are now. I'm depersonalizing my whole house and packing everything away. Sad as it is, you'll probably need to take down a lot of the pretty things you have displayed. On the plus side, it's only temporary. I did not know you lived near me and I have did not know you had a blog. I am heading over to check it out. Today I spent the whole day taking down stuff off the walls and depersonalizing the rooms. So hopefully that will show buyers that they can evision their style and decor. These changes must have been so hard to do, but in the long run, I know it will help with the sale of your home. The first thing I notice is your beautiful hardwood floors, buyers would be crazy not to love them. I can't even imagine what it will be like if and when we decide to sell. I'm sure it won't be long before the perfect buyer comes along. Kris, I know that now days realtors want the homes to be very stream lined. They say that the younger generation have a hard time seeing past the décor and if it's not their style they can't envision it with their things. Also, they say that they often are so busy looking at the décor that they really don't even seethe home. Hopefully this works. I think it looks great for selling! Hi Kris, I think your home is just gorgeous! We had our home on the market several years ago (we decided then not to sell) but I remember how hard it was for me to remove some of the "stuff"...because I, too, like my"stuff"! You are right, many of the young people looking to buy homes today have been spoiled by watching too much HGTV I think! I don't care for the streamlined look but I guess there are many out there. Good luck in selling and great first week feedback! Have a great weekend! Kris, you're doing great and on target. I've bought and sold lots of houses in my life, and you're going at it with the right attitude. Many buyers don't have a vision for what they can do with a house. It has to be easy for them to see their stuff there. This is the hard part, trying to live in a place when you're having to let it go in your mind and heart. I know God has a wonderful place for you guys and a great job for your hubby. You guys are in my prayers! Isn't this a pain in the back side? Your home is so beautiful and so you. I have dear friends that have been realtors for eons...about the best in this area. They always say to remove any personalization, family photos, hobbies, etc. It seems there are so many that don't have the "vision" to see the basics of a home or the upgrades. My heart goes out to you and Terry ~ such a process! I do know that God's timing is perfect and sometimes the answers come at the 11th hour. You remain in my prayers! If I were closer, I'd be more than happy to try and help. Wow, I loved your decor. 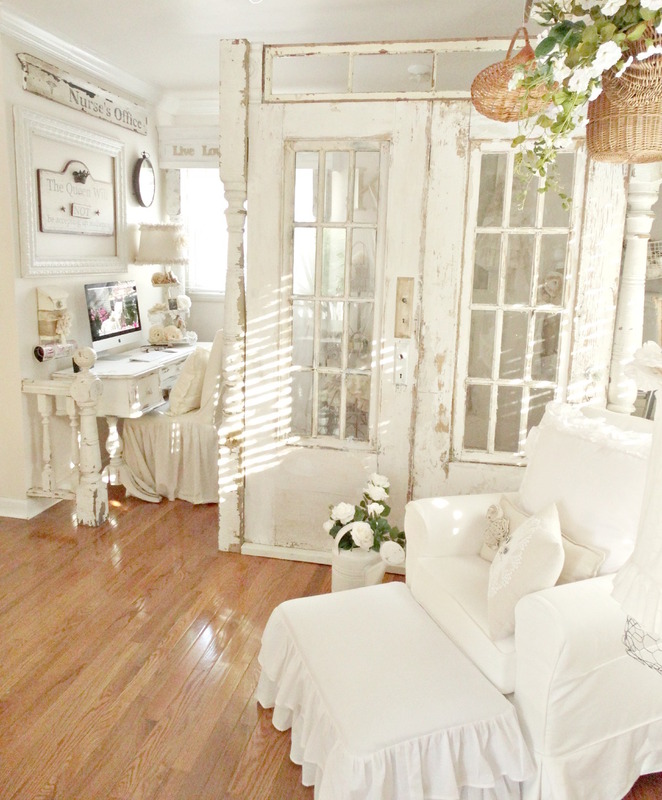 The white is just so bright, airy and just lovely. I loved the wood floors and wish we had them in our home. I do hope you sell your home easily. I really liked it. Hey Kris! Great choice to take the room divider down. First time home owners are a breed of their own and you really have to spell it all out for them. We have sold 3 houses and very time I have to remind myself to decluttered and when I'm done, remove even more! What they really want is a brand new house for the cost of an older home and you are right, they have no idea what upgrades cost! Your home is beautiful and prospective buyers will love. Your floors are gorgeous! Best wished on the sell. Hello Kris! What a wonderful article. I love your home and style of decorating. I, too, have never heard or seen this magazine so would love the opportunity to win a copy!